from the selection of locally grown chiles to the prep, production and packaging of each jar. Ben Tuorto, an avid chile and spicy food enthusiast. After 20 years of enjoying all things spicy, his fiery enjoyment came mostly from the use of fresh chile peppers, of all heat levels, with a penchant for the hottest he could obtain. Turned off by the flood of gimmicky and often unpleasant tasting hot sauces and single dimension hot salsas, Ben was inspired to use only fresh chiles and began exposing many friends and family members to his love of adding heat to food. 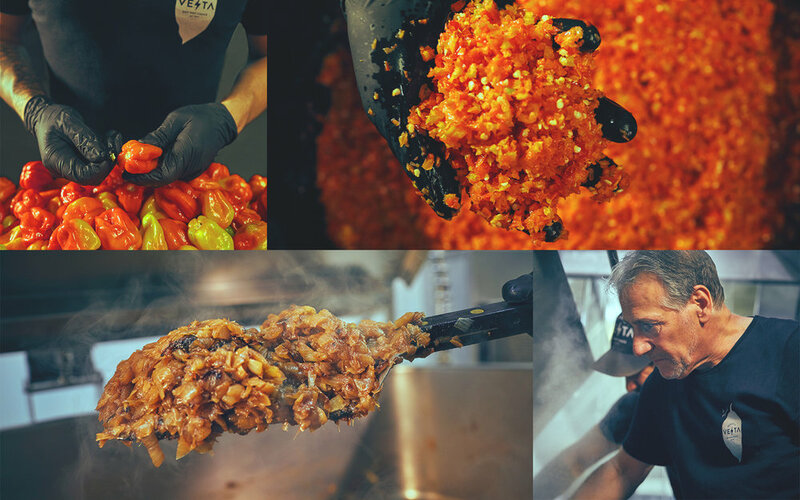 After several years of perfecting the right combination of flavor and heat - Vesta was born. Our branding and packaging have come a long way since the honey pot jars and leaflets we started with in 2007. After years of research, product sourcing, and community feedback we've created a unique and unifying look for our original product in a jar that delivers it onto your favorite dishes in a simple shake.